Jazz Violin, Guitar & Bass… Ramo, Pizzarelli & Bruno. A swinging program that recalls the spirit of Stephane Grappelli and Django Reinhardt, this contemporary trio of veteran jazzmen delivers straight from the heart. CD Review March 2006: Courtesy of "All About Jazz"
With a swinging program that recalls the spirit of Stephane Grappelli and Django Reinhardt, this contemporary trio of veteran jazzmen delivers straight from the heart. Up-tempo romps, such as “Have You Met Miss Jones” and “Oh Lady Be Good,” find the trio pulling out all the stops in a celebration of syncopation, swing, and sunshine. The program jumps lively, as the acoustic trio provides a cohesive affair steeped in tradition and mellowed with age. Slower pieces, such as "Autumn Nocturne” and “Nuages,” allow the trio’s lyrical melodies to flow gently and settle in comfortably as each artist reaches back for inspiration. The music flows like a meandering country stream through a meadow of colorful wildflowers. All three gentlemen display a deep respect for melody. Michele Ramo leads with a superb touch, garnering every ounce of flavor from each piece. His “Stardust” brings tears to the eyes. Bucky Pizzarelli steps forward with lucid solo spots that belie a sincere love for these classic songs, while Jerry Bruno provides a strong bottom foundation. His lovely bass solo on “Have You Met Miss Jones” dances around its familiar melody with a resonance that evokes heartfelt spirit. Violinist Ramo applies a variety of techniques in his portrayal, flowing with seamless legato when desired, and jumping with a sprightly pizzicato when the mood calls for it. He interprets with the emotional strength of Gypsy soul, American Swing, and a universal song appeal. The ballad is putty in his hands. “Oh Lady Be Good” represents a deep love for the essence that can only be found in beautiful songs. It takes two to tango. One side writes the songs, and one side interprets with love. The songs of Irving Berlin, George Gershwin, Richard Rodgers, Burton Lane, Johnny Mandel, Django Reinhardt and Stephane Grappelli do a special dance when interpreted by Michele Ramo, Bucky Pizzarelli and Jerry Bruno. Track Listing: Oh Lady Be Good; Autumn Nocturne; Crazy Rhythm; Everything I Have is Yours; Have You Met Miss Jones; They Can’t Take That Away From Me; Nuages; Stardust; Tears; Mélodie au Crépuscule; A Time for Love. 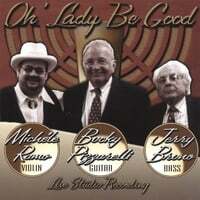 Personnel: Michele Ramo: violin; Bucky Pizzarelli: guitar; Jerry Bruno: bass. This is a great swing jazz cd.It contains wonderful songs played by outstanding musicians.It is enjoyable to hear them play with class. Surely one of the best recordings ever. smooth jazz even my 3yrd old class loves it! I bought this CD for my mother-in-law for mother's day - loved it so much I bought one for myself. If you like jazz, you will want this one!